An open sanctuary for mountain animals, hike into the Merlet Animal Park to explore the animals in their natural habitat. 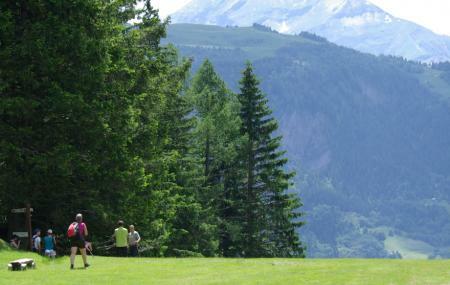 Spread across 21 hectares, the park is situated at an altitude of 1,563m above the Chamonix valley. It was established in the year 1968. The Merlet Park shelters more than 80 mountain animals. The animals include Ibex, Chamois, Mouflon, Fallow Deer, Sika Deer, Roe Deer and the Marmot to name a few. There are no fences in the park. The animals roam freely and can be easily approached. However, it is advised to be respectful of their space and maintain a safe distance. Keep ten meters between you and the animals. Do not try to touch them. Feeding the animals if prohibited. For groups of 15 or more: Adult (15+): €5, Children (4-14): €3. Train stop Chemin des Sablieres. Around 20 minutes drive by car. How popular is Merlet Animal Park? People normally club together Tramway Du Mont Blanc and Saint Bernard Breeding Centre while planning their visit to Merlet Animal Park. Amazing place to visit with kids and family! Our kids enjoyed it so much to see the wildlife. Very nice nature park. Worth the visit for the animals, a nice walk, and great vista of the glacier across the way. We saw many animals up close - chamois, deer, bucatins, marmottes. Even for a gray/rainy day, it was a good time with the family for a couple of hours. NOTE: If you have small children (or if you're pregnant), it is highly recommended to park as close to the entrance as possible. Parking areas 3 and 4 are about a 1km walk uphill. Nice place to walk around and get close to the animals waking around freely. Also because it is pretty much a top a mountain the view is quite stunning. Price was also very acceptable. Only issue was that the line for the toilets was long. The park offers a nice walk along winding pathways through meadow and forest. It is possible to see a number of mountain animals in their natural habitat. Though the animals are quite close it would be nice to bring a pair of binoculars. From this place the view of the Mont Blanc range is absolutely spectacular. The price of the park is reasonable.